Perfect for exploring basic measurement concepts. 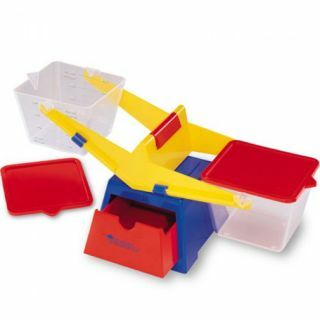 Measure, explore volume and compare solids and liquids with this sturdy balance. Calibrated clear buckets with removable lids hold solids or up to 400 ml of liquid. Easy pour spout makes measuring liquids easy. Lids can also serve as platforms and the built-in drawer is perfect for storing weights.